At the Region is an ongoing feature that discusses the state-by-state training, certification and employment requirements of first responder departments across the nation. 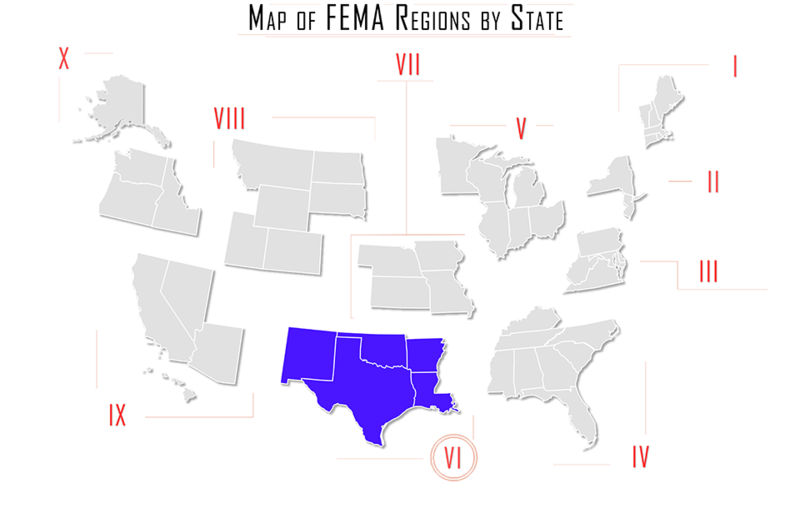 In this issue, At the Region looks at requirements for law enforcement officers in FEMA Region VI: Arkansas, Louisiana, New Mexico, Oklahoma, and Texas. The Arkansas Commission on Law Enforcement Standards and Training (CLEST) establishes minimum selection and training standards for admission to employment as a law enforcement officer in Arkansas. All applicants for law enforcement positions must meet the requirements established by CLEST and complete CLEST approved training to obtain their certification. The Office of Law Enforcement Standards oversees employment, training, and certification requirements established by the CLEST. To complete the certification process, newly employed full-time officers must complete the Law Enforcement Basic Training Course within the first 6 months of hire. All law enforcement officers and county corrections officers must also complete the Mandatory Firearms Training Course. • Be fingerprinted and a search initiated of state and national fingerprint files to disclose any criminal record. • Be free of a felony record. A felony record means having entered a plea of guilty, been found guilty, or otherwise having been convicted of an offense, the punishment for which could have been imprisonment in a federal penitentiary or a state penitentiary. The fact that an individual has received a pardon, or their record has been expunged does not release the individual from having a felony record. • Be of good character as determined by a thorough background investigation. • Be a high school graduate or have passed the General Education Development (GED) Test indicating high school graduation level. • Be examined by a licensed physician and meet the physical requirements. • Be interviewed personally prior to employment by the department head or his representative, or representatives to determine such things as the applicant’s motivation, appearance, demeanor, attitude and ability to communicate. • Be examined by an individual licensed to practice psychiatry or psychology and qualified to perform such evaluations in the State of Arkansas, who after examination finds the officer to be competent and recommends the agency hire the individual. • Possess a valid driver’s license. You can find more detail on these requirements here. The commission can issue a waiver for equivalent training upon presentation of documentary evidence by a department that an officer has satisfactorily completed equivalent training. • Training received in a state with laws governing or regulating law enforcement training must, if subject to such review, have been approved or certified in the state in which the training was received. • The Commission may elect to prescribe as a condition of certification the satisfactory completion of the Law Enforcement Officer Refresher Course or other supplementary or remedial training necessary to equate previous training with current standards. • For certification purposes, those Full-time Law Enforcement Officers who have not met the minimum classroom hours of training, but have accumulated at least 50% of the required hours may, at the discretion of the Commission, receive ten (10) classroom hours of credit for each year of Full-time law enforcement experience. • Those who qualify for this equivalent training waiver will be required to satisfactorily complete the Law Enforcement Refresher Course. • Where approved by the Commission, individuals who meet all other requirements of certification, and who receive a waiver under this regulation, shall be entitled to certification after the completion of the appropriate probationary period. The Louisiana Peace Officer Standards and Training Council (POST) develops training standards for peace officers in the State of Louisiana. The Council is responsible for developing and evaluating the curriculum of mandatory basic training courses for municipal officers, deputy sheriffs, state police, wildlife agents and all other persons commissioned as peace officers, defined by state law. • Be at least 20 years of age. • Be able to meet the physical demands to perform the duties of a police officer. • Have 20/20 corrected vision, not greater than 20/100 uncorrected vision, and you must not have any color blindness. • Not have a criminal history. • Have no physical limitations or deformities that would prohibit you from completing the duties of a police officer. • Undergo a polygraph interview and examination. • Pass a physical fitness evaluation consisting of a 1.5-mile run, push-ups, sit-ups, and an obstacle course. • Submit to a background investigation. • Participate in an oral interview. • Undergo a medical and psychological examination. • Present a valid out-of-state POST certificate of training. • Successfully complete the Louisiana Law Enforcement Basic Training Manual, "Legal Aspects" Section, and Firearms section, and qualify on the POST firearms qualification course. • Qualify on the POST firearms qualification course, as attested to by a certified firearms instructor. • Pass the statewide examination for peace officers with a minimum score of 70%. If there has been an interruption of service in excess of five years, the officer is required to attend the full basic academy. The Training and Recruiting Division of the New Mexico Law Enforcement Academy Board, under the Department of Public Safety establish rules, policies, qualifications, and standards for the employment, certification, and training of law enforcement officers and ensures compliance with the New Mexico Law Enforcement Academy Board Rules. • Be 21 years of age at the time of your academy graduation. • Have a valid New Mexico driver’s license. • Have no felonies, frequent criminal activity or improper conduct on your record and you must have an excellent driver history. • Have 20/30 corrected or 20/100 uncorrected vision along with satisfactory color and depth perception. For enrollment in the New Mexico Department of Public Safety Training Center’s Basic Police Officer Training Program, or New Mexico Regional Academy Program, applicants must submit a complete Basic Police Officer Training Application Packet. New Mexico has a waiver process to become a certified peace officer for those individuals whom the Board has previously certified but whose certification has become inactive or for those individuals who have functioned as a peace officer in another state or with the federal government whose training and experience substantially conform to the basic course curriculum of New Mexico. Every applicant for certification by waiver of previous training must meet all qualifications and requirements as established in New Mexico statutes and New Mexico Law Enforcement Academy Board administrative rules. Any previously certified New Mexico peace officer must attend the Certification by Waiver program if they have been out of commissioned law enforcement for more than two (2) years without six (6) consecutive months of service. Any applicant who has not been employed as a full-time law enforcement officer for a period in excess of eight (8) years must attend the basic police officer training program to become certified. The Director may consider the applicant’s certified law enforcement experience and give credit of 40 hours per year for each year of service, up to but not to exceed ten (10) years, for a total of 400 hours and, the applicant will receive credit for advanced training, up to but not to exceed 400 hours. Applicant experience and training must be equivalent to the current minimum standards of training curriculum in effect at the time of application, which is currently 824 hours, unless such deficiencies are covered in the Certification by Waiver Program. For those wanting to challenge the exam, more information and exam dates can be found here. The Oklahoma Council on Law Enforcement Education and Training (CLEET) is established under Oklahoma Law to provide for basic peace officer certification, establishing and conducting basic academies for all full-time peace officers employed by city, county, or state entities of government, with the exception of approved academy agencies. CLEET also provides for basic reserve officer certification for reserve peace officers employed by city, county, or state entities of government, by providing the curriculum, setting minimum standards, and by administrative oversight. • Be at least 21 years of age prior to certification as a peace officer. • Must be a United States citizen or in resident alien status, as defined by U.S. Citizenship and Immigration Services. • Must not have been convicted in state or federal court for any felony, crime of moral turpitude, or a crime of domestic violence. • Must have fingerprint clearance from Federal Bureau of Investigation and the Oklahoma State Bureau of Investigation. • Must have undergone psychological evaluation by the employing agency using a psychological instrument approved by CLEET. • Must be commissioned or appointed by employing agency prior to attending CLEET approved certification training. • Must not have been involuntarily committed to an Oklahoma state mental institution. • Must certify that he or she is physically able to fully participate in and complete all phases of the CLEET Basic Peace Officer Certification Academy as mandated in CLEET rules. • Must submit all required documentation and enrollment materials. • The officer must meet the minimum peace officer employment standards set forth by law. • The officer must have been employed as a full time peace officer for at least three (3) months within the two (2) year period immediately preceding the request for Oklahoma certification. • The officer must attend training as specified by CLEET. • The officer must successfully pass a certification examination which is designed to be scored by functional area blocks, with the exception of skills training functional areas which shall not be tested. Officers must pass every functional area block tested at a standard prescribed by the Council. Officers may have one retest for each functional area block which they fail. • If an officer fails both a block test and a retest for any given functional area, then that officer must successfully complete the corresponding functional area in a CLEET Basic Academy, to include successfully passing the block examination(s). Any retest would follow the guidelines listed in OAC 390:15-1-13. • You must not have been convicted of a Class "A" misdemeanor or a felony, or of a Class "B" misdemeanor in the last 10 years. • A high school diploma or general equivalency degree is required, and the age requirement is 21, unless you have 60 college hours and two years active duty in the United States military. • If so, then you are eligible at 18 years of age. All police officers in Texas are required to hold a Texas peace officer license. There are two 24-month periods in the current training cycle which ends on August 31, 2017. The first 24-month period, or unit, began on 09/01/2013 and ends on 08/31/2015. The second 24-month period, or unit, begins on 09/01/2015 and ends on 08/31/2017, which is also the conclusion date of the 48-month training cycle. If you are a law enforcement officer from other areas review the “Out of State/Federal Application.” To obtain Texas licensure you must meet all of the work, training and application requirements. You will be required to complete an initial application, including fingerprints through FAST, to determine your eligibility. Do not proceed to the next steps until you have received approval for eligibility, which TCOLES will send you by mail. • Appointment by a law enforcement agency within two years from the date of your passed examination. The Texas basic licensing course must be completed if the initial application for eligibility is not approved; or the examinee fails all three attempts to pass the licensing exam; or the examinee fails to complete all three attempts within 180 days from the completion date of the licensing course; or the examinee is dismissed from an exam for cheating. If dismissed from an exam for cheating, all remaining attempts are invalidated.